Program Contents: 127 pages, covered spiral bound book. Includes WIN/MAC CD-ROM with printable PDFs. The logical next step, Conversation Skills II teaches students how to remember names, develop friendships at work and in the community, and extend conversations beyond a one answer response. 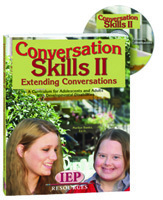 A new feature of this second book also by speech and language therapist Dr. Marilyn Banks is the ability to graph the progress of students in a form understandable to parents and teachers. The graphing of work related conversation will give you invaluable documentation of student IEP progress.